Contributed by: Carl Beck & Elliot Welz. The "Series I" Datsun 240Z's were produced between Oct. 1969 and Jan. 1971. This production period covered two Model Years (1970 & 1971). However Datsun did not implement design or production changes based on Model Years, but rather on Calendar Years durring this period. 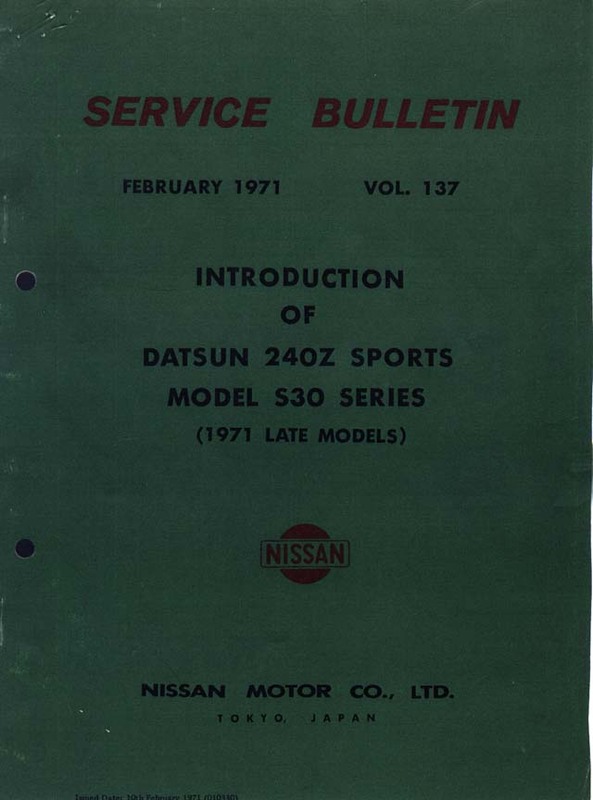 So with the begining of the Calendar Year 1971 Datsun introduced what they refered to as the "New 1971 late model Datsun 240Z Sports". We refer to these as "Series II" Z Cars. Listed below is a summary of the design/production changes incorporated in the "Series II" 240-Z's. This information was published in a Datsun Factory Service Bulletin dated: Febuary 1971, VOL. 137. According to this Service Bulletin the changes were to be put into production with HLS30 21001 and HS30 0501. 4. Reversible Key-for starter, steering lock and glove box. The new 240-Z features a "Tilt" mechanism for its reclining seat. By this the seat can be tilted forward to permit easier acess to the tools or baggage stowed behind the seat back. Note: although listed as an "Option" in this Factory Service Bulletin - none were imported into the North American Market. 4. Windshield Wipers - speed up from 68 strokes per minute to 75 spm on "High" speed.